The first [surviving] photographic image is Nicéphore Niépce’s View from the Window at Le Gras, while the first photographic negative is from Fox Talbot’s latticed window in Lacock Abbey. It seems more than a mere coincidence that the first images produced by the new representational medium pictured the 15th century architect, sculptor, painter, and theorist Leon Battista Alberti’s metaphor for painting: “…an open window through which the subject to be painted is seen” While the former show a grainy image of rooftops out side of the French chemist’s window, the latter brings to mind Albrecht Dürer’s glass frame with grids, the painter’s aid for accurately preserving the figure’s spatial relationships. 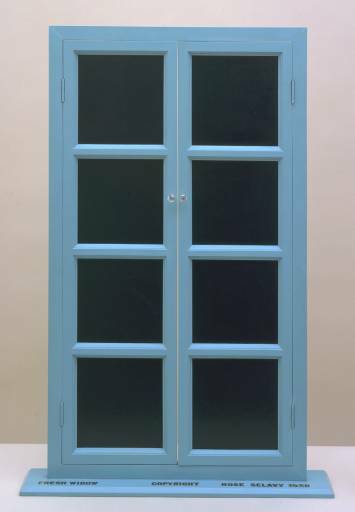 Alberti’s window was not one that opened to the real world out side, but rather its purpose was to produce a window-view of the painting’s subject for the spectator. Similar to fenestra caeli, the “window of heaven” where through figure of Mary the Lord’s light shines over the spectator, standing in front of the painting from a fixed position, it will open to the historia (imaginative narrative paintings of great events and classical heroes) as an architectural window opens to the orange tree, or the parking lot outside. Until the invention of photography, painting’s technical progress was to deliver an image that seemed perceptually identical from the view through an open window. But the windows that Niépce and other pioneers of the new medium opened, let painting shut the blinds and walk outside of the camera lucida of appearances of the world outside. Painting stopped cross-dressing itself as a window, refused to serve as a decoy, a real-looking surrogate, painting stopped being a [hieroglyphic] text. A lie could now be a color, an impression a flat surface, a feeling an illusion of depth. Just as the Reformation freed the image from God and gave it to the word, photography untied painting from the appearance of the real. Curiously, while painting’s history (until the invention of photography) is one of maximizing its representational quality to that of an open window, history of photography on the other hand is of a representational medium’s departure from reality. Painting progressed [technically] to render the imaginary real, photography the real as imaginary. Photography at its best claims to show that which is beyond representation, a window that opens to that which does not render itself visible. Therefore at its best, photography questioned its own indexicality and claimed to represent beyond the mere traces of light on the sensitive emulsion. But simultaneously it was through its very indexicality that photography could point beyond its semiotics. From the surrealists to the avant-garde, from propagandists to documentarists, all used this inherent tension of the photographic medium. Thus the photographic index became form, a vessel that carried a semiotic displacement. Colin Powel’s fraudulent presentation before the UN Security Council in support of the Iraq war is a telling contemporary example of this semiotic displacement. Images, aerial photographs and satellite images were used to show exactly what the images were not an index of, rather the representational quality was used as a rhetorical device in support of the administration’s argument that hinged on the existence of weapons of mass destruction storages and facilities. Here, the indexicality of the photograph transformed the contents of the target’s landscape to the desired constituents. But this rhetorical maneuvering is hardly unique to the Pentagon, from early years of snap-shots, people were expected to smile in photographs, here the landscape smiled for the aerial photos. Furthermore, before photographs made time stand still, photographed subjects had to stand still to be captured by the camera. Before cameras could capture the world, the world had to practice posing for the cameras, thus the technological advancement of photography from its outset carried a semblance of an index. Rather than the smoke rising from the chimney signifying the fire, it was the fire that burned to be signified. 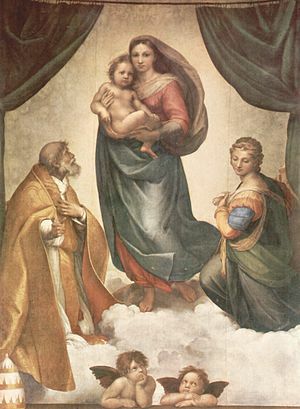 In Sistine Madonna, Raphael, alluding to the tradition of picture curtain—a curtain before the cult image which can conceal and reveal it as a ritual apparition—frames his painting with an open curtain. “When the costly curtains were drawn back, the divine conception of the painting (the Iddea) appeared as if alive, being the divine person (iddio) in the ideal of beauty (idea), thus uniting religion and art in one.” The curtain is the only remaining residue of the material image, that curtain’s reincarnation is the photograph’s indexicality: it conceals as well at it reveals.